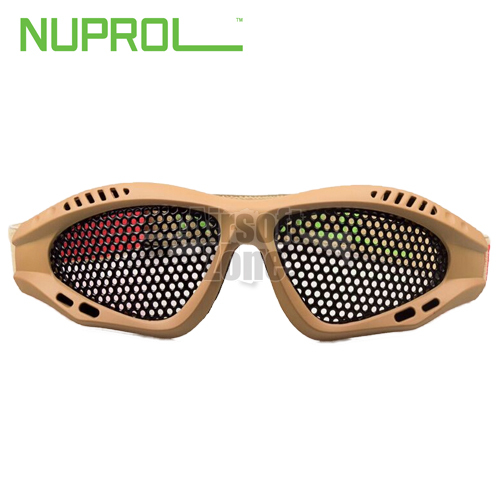 Taking influence from looks and styling of the most popular mesh goggles on the market, NUPROL have addressed many factors with the new eye protection range. High-density, high strength polymer frame houses a custom specified mesh "lens". Tested up to CE safety standards, the NUPROL range of eye protection has been awarded CE Certification for safety. This makes them the safest mesh goggles you will find on the Airsoft market today. Best spacing possible for mesh holes to allow more light in without any safety impact. The highest quality polymer material for hard wearing and durable frames. New foam padding for more comfortable fit and eye seal for safety. High quality extreme sports industry standard safety strap.